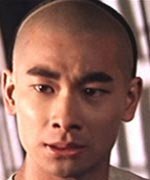 After being discovered by Tsui Hark in 1992, Chiu was being touted as the next Jet Li. He shares the same innocent charm, fabulous skills, was brought up in Beijing and even trained at the same martial arts school - but unless things change in the HK film landscape, it is unlikely that he will ever achieve Jet's success. These days he is doing much more TV than film.